Most of us only have one wedding day, and we spend a lot of time and money on it. But while we plan almost every moment from when people arrive, to what they eat, we often forget the opportunity to make our choice of transportation more than an afterthought. How you get there, and more importantly how you leave, can say a lot about your special day. Choosing a fun mode of getting around can add even more joy to your big day, that lasts even after the reception ends. Here are six awesome ways to make your wedding transportation particularly memorable. Which Wedding Day Transportation Option Makes Sense for You? This one will take a bit of planning, but it is one great way to leave your wedding. What couple doesn’t want that picture of them waving to the crowd from the back of a train? If you live in an area that has public transportation via train, you can contact them to see if they offer any wedding transport services. You can also find train rides in a variety of other places – most of these are private and designed to take people on short tours, but that doesn’t mean you can’t stop at a location and hitch a ride. Your wedding day should be fun and have a few elements of surprise, so give a nod to the past and rent a school bus to move your wedding party from the ceremony to celebration. You can also add some music from your high school years to bring back memories, and depending on the laws in your area you might be able to get away with sneaking some adult beverages on the bus. A big yellow school bus is also an unexpected way to arrive at your reception; your guests won’t see it coming! Also check to see what additional services your bus rental offers (and check out our previous article highlight why school bus transportation for your wedding is a smart choice). If you are dreaming of a vintage wedding, finding the perfect vintage car is a must. Most classic car rental companies will offer a variety of options to fit the decades between 1920 and 1960. You should be able to find a wedding package that provides an antique fitting the style of your wedding – packages usually include a chauffeur, plus photos taken with your day’s set of wheels. You can also include additional vehicles to transport your entire wedding party in style. The only way to end a fairy-tale wedding is by leaving in a horse-drawn carriage. 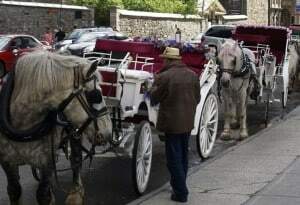 But remember that you can also use several carriages to take you and your wedding party from the ceremony to the reception for a more dramatic entrance. Common choices to consider include the classic Cinderella carriage where you’re the star of this classic tale, or a Victorian wedding carriage that allows you to be a princess for the day. Most carriage companies include a three-mile maximum and most start with a two- to three-hour timeframe. If you want to arrive at your wedding like a celebrity, a stretch limo is a great option to choose. You will feel like a VIP when you pull up to the reception in your chauffer-driven ride. If you want to take it to the next level, consider using an SUV limo. These super-sized rides are part limo, part party bus, and can hold up to 20 people – all this makes it a fun option for transporting your wedding party to your reception location. If you want a showstopping arrival, consider a vintage trolley. Trolleys are great for wedding photos, and they will add an unexpected element of glamor to your wedding. They can also transfer your entire wedding party, which makes them the perfect way to get everyone to the party on time. When you decide on a wedding transportation option there a few steps you should take. First, choose a company and book your transportation early. You don’t want to find out that you cannot get the perfect princess carriage a week before your wedding. Plan ahead and be prepared. Next, you should know the rules for your selected mode of travel; you don’t want to bring champagne to a school bus without knowing if it is permissible. Also, don’t rent based on a picture alone – take the time to visit the rental company well before your wedding date to avoid ending up with something you weren’t expecting on the big day. When you choose a fun mode of wedding transportation you not only get to arrive and leave in style, but you also give yourself and your wedding party a good time along the way. Selecting something that works with your theme can add that little something extra to the event that will keep people talking about your wedding for years to come.